This article is a translation of an article I read in the German magazine Handelsblatt Karriere recently (issue nb 4, year 2014), called “Titel-Helden” (Title Heroes) written by Eva-Maria Hommel. 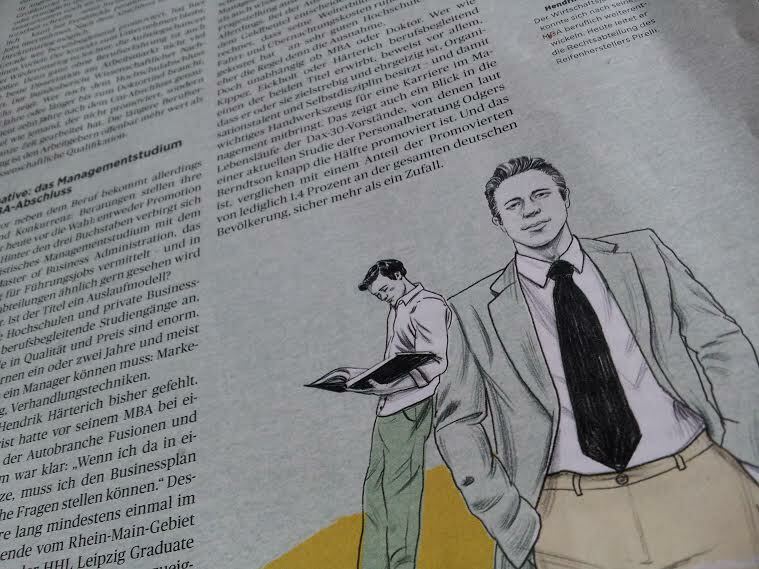 The article addresses the interesting question of working on a PhD early in a corporate career, and I felt it was interesting enough to be shared with an English-speaking audience, beyond the relatively small number of people who speak German in this world. 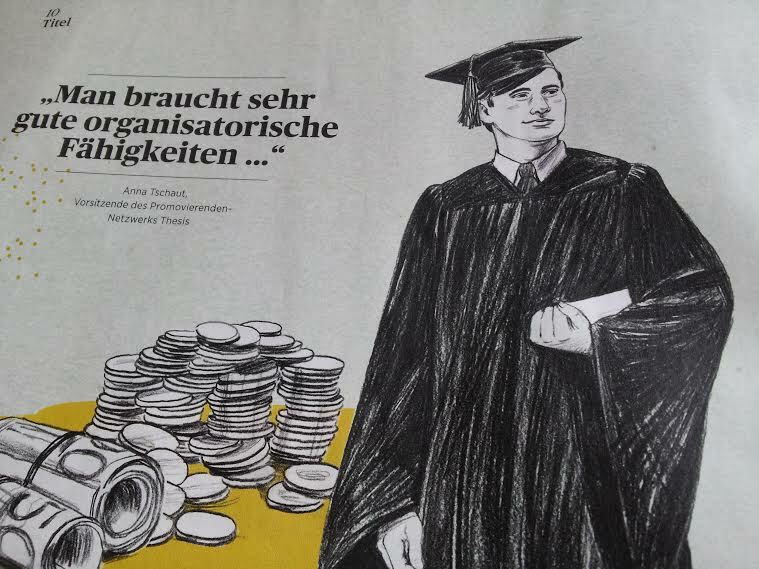 I believe it is an insightful article that shows the German specificity of valuing the PhD beyond academia, which is the case in France or the US, and bridging the gap between both worlds. Note that the translation is an exact translation, which I tried to make as easy to read as possible, just removing a very few passages. Illustrations, links, emphases or bold passages have been added by myself. Working in the office by day, working on the dissertation until late in the evenings – some work debutants do almost everything for the PhD title. 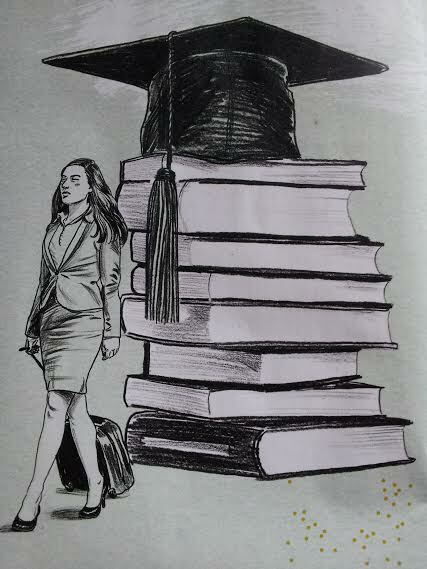 Getting a PhD degree beside the job is popular. The question is: for whom is this worth it? Two letters and a dot, this is what Jenny Kipper has spent several sleepless nights for. To get the “Dr.” in front of her name, she sat in front of her desk on evenings and weekends, instead of spending time with family and friends. Over the week, she worked as head-hunter at a human resource start-up company. The work had little to do with her dissertation topic – personal development and quality management used by pedagogy: “You come home, tired, in the evening, and then you have to squeeze your brain,” the 31-year old [says]. After all, she could reduce her week to 4 working days, and concentrate on the thesis for one whole day on Fridays. But even this was not always possible: “When emails arrived on my phone, I answered them,” she says, “because I always felt that I had to respond to my employer’s needs first.” Eventually, she had to stop working for one full year to work on the dissertation. Torn apart between PhD studies and corporate career – many academics struggle with the same demons than Jenny Kipper. Over 34,000 of the about 200,000 PhD students in Germany work on their dissertation while working on the side. The question is: For whom is it worth it? Does the “Dr.” end up being oddly displayed on the résumé or in an email signature? This is even more a question after the plagiarism affairs of the past years because, as one could tell from the uncovered plagiarist CSU politician Karl-Theodor zu Guttenberg, the scientific quality of the dissertation can be harmed substantially when someone assumes “another life” beside research. Anna Tschaut, head of the PhD student network Thesis, believes that writing a dissertation beside a regular day job is feasible only under certain, specific circumstances: “You need very good organization skills to be able to wrap this up in a short time frame of several years,” she says. It is of utmost importance to have regular contact to the doctoral advisor, which can be especially tricky for those who do not spend their days on the university. Being fully committed to a corporate job and writing a dissertation besides is a big endeavor – and many don’t only do it out of scientific interest. Why do so many people aim for the “Dr.” title, knowing that they are very likely not to stay in academia but to stay on the corporate side? In some sectors, the title serves as a career booster and is worth a lot of money. Jenny Kippers doesn’t know whether her title will earn her more money, but the odds are high. Ten years after defending their dissertations, over half of the PhDs who work in corporate jobs don’t have any link with research anymore, while still earning a 20% more than their colleagues who haven’t the title. This is what research from the German “Bundesbericht Wissenschaftlicher Nachwuchs” (National report on scientific offspring) indicates. Add to that, that around 80% out of them believe that their positions and salaries correspond to their skills and qualifications – against roughly 60% for those without the title. This indicates that, yes, a PhD is worth it. In the German-speaking countries, you can see a distinctive career path emerge. “In other countries, the PhD – which is equivalent to the “Dr.” title – is seen as the beginning of a scientific career,” explains Christian Krys, head of the dissertation department at Roland Berger, a Munich-based consulting firm. In other words: in the USA or the UK, almost no one goes into corporate careers after a PhD. In Germany, however, many companies actively encourage their employees to engage in doctoral studies. Corporations like Deutsche Telekom, VW and Thyssen Krupp have doctoral programs, similarly to law firms like Linklaters or consulting firms like McKinsey or The Boston Consulting Group. Roland Berger, too, allows its employees to take some time off while continuing to pay a reduced salary. One of them is Jonas Eickholt, who already thought about doing a dissertation during his studies, but who started in consulting directly after his internship in 2009. “This was much more thrilling for me at the time.” He became project manager for clients in the financial sector and worked mainly for banks and insurance company clients, but he did not abandon his dream to fully engage in a scientific project like a dissertation, which eventually led him to apply for the doctoral program. He took one year off and researched in the field of online financing for real estate. Companies like Roland Berger don’t do that for the sake of science, they do that to take advantage of the doctors’ knowledge. “When someone writes a dissertation about supply chain management or marketing, we can often use this knowledge for consulting,“ Krys explains. A second reason is reputation and image: “In the classical sectors, many employees have PhD degrees, and it can be of advantage to offer them consultants with the same degree.” Additionally, the firm hopes that the doctoral program can attract and retain motivated and skilled employees. The title brings along even more advantages, when the person’s knowledge is needed within companies. Helen Reck, director of human resources at the law firm Freshfields Bruckhaus Deringer, says: “When someone write a dissertation, let’s say, in anti-trust laws, he can use his knowledge in his work for a client.” People who have a PhD title often also have solid methodological skills. Like Jenny Kipper, who interviewed 30 experts for her dissertation, mainly in the Rhein-Main area. She now works for a major human resources service firm, preparing and conducting interviews with many candidates. “[In my work] I can use the methods and the knowledge that I aquired for and used during my dissertation,” she says. There is competition, however, to the dissertation: Consulting firms offer their employees to either pursue a doctoral degree, or an MBA. These three letters, which mean Masters of Business Administration, stand for rather generalistic management studies with a heavy focus on leadership skills. Human resource departments do like the MBA titel a lot – what does it mean for the dissertation? A lot of private and public business schools offer part-time executive education programs, and the differences between them are enormous. Students learn, during one or two years and mostly in English, what a manager must be able to master: Marketing, Finance, Negotiation. This is exactly what Hendrik Härterich needed. Before his MBA, the business lawyer was responsible for mergers and aquisitions in the automotive industry, and he wanted to step up his game: “When I sat in a negotiation meeting, I had to understand the business plan and ask the right questions.” To do that, during two years he drove at least once a month to the HHL Leipzig Graduate School of Management, on the other side of the country. His new skills helped him to become the head of the legal department of the tire producer Pirelli. But, independently from MBA, DBA or PhD, those who acquire one of those titles while working in parallel prove that they have the ambition, organisation skills and discipline to engage in high-level management careers. If you look at the list of the DAX companies, you will notice that around half of their CEOs has a “Dr.” title, according to a study by consulting firm Odgers Berndtson. This is probably, compared to the 1.4% of “Dr.’s” in the overall German population, nothing but a coincidence. But, independently from #MBA, #DBA or #PhD, those who acquire one of those titles while working in parallel prove that they have the ambition, organisation skills and discipline to engage in high-level management careers.